You might have noticed, that in the past few months, motherboard vendors have come up with a variety of boards, which are based on the C236 chipset from Intel. This is actually a server chipset which also supports Xeon processors and ECC memory, but still the motherboard makers have a selection of boards in their portfolios which target gamers and enthusiasts. Since we’re about to come up with a review of such a C236 based motherboard, we thought it might be informative and helpful to first publish an article on what are the differences between C236 and Z170 chipset. First of all let’s have a look at which one of the motherboard vendors, who is active in the enthusiast and gaming segment, actually has such motherboards in their portfolio. 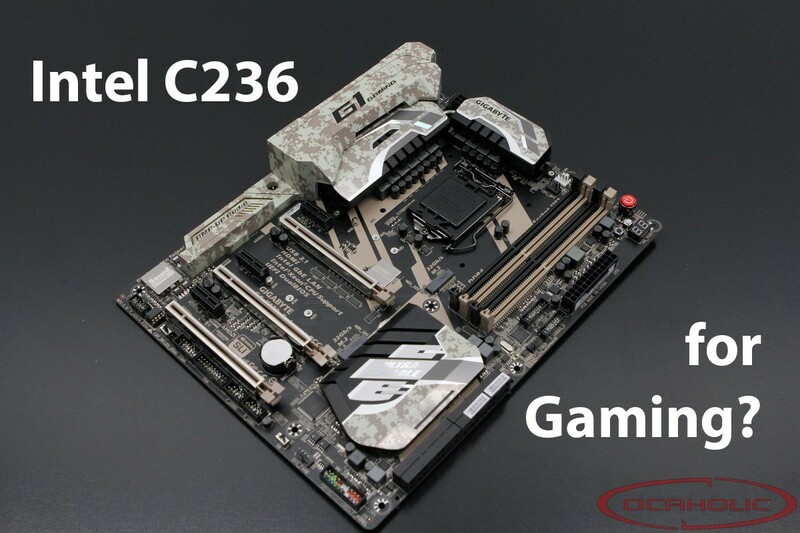 Our research indicates that ASUS, Gigabyte and MSI offer boards based on the C236 chipset. It’s interesting to see that the different vendors target entirely different market segments with their offerings. ASUS for example is addressing the entry level server market with its C236 based boards, while MSI targets the workstation segment and Gigabyte is trying to convince enthusiasts and gamers of this platform. Since the entry level server and workstation market are basically what the C236 chipset in combination with Intel Xeon processors has been built for, we’re asking ourselves: what are the advantages for gamers and enthusiasts? To answer this question we need to have a look at what the consumer counterpart – Z170 – has to offer. The easiest way to do so is by compiling a list covering the different features. Having a closer look at the comparison table quickly reveals that the C236 chipset comes with a variety a managing features such as support for ECC memory and Xeon processors as well as vPro, RST Enterprise, Node Manager and so on. On the other hand Z170 scores with things like overclockability and a little more flexibility regarding additional USB 2.0 ports. Overall the line Intel has drawn in between the two chipsets is pretty clear and the workstation and server segment (C236) is clearly separated from the upper mid-range consumer market (Z170). Therefore it’s apparent that C236 based motherboards will most likely be found in small business environments, while Z170 based motherboards are going to be ones preferably used for gaming rigs. Nevertheless the question remains why for example Gigabyte released a motherboard targeting gamers and enthusiasts, where the motherboard maker uses a C236 chipset. Features like gaming grade audio, Killer Ethernet as well as eye-catching design are not particularly common when it comes to server/workstation chipsets. Maybe they’re trying to convince get the attention of gamers and enthusiasts with high reliability. Looking at Gigabyte’s portfolio we noticed that with Z170 there haven’t been any new “BK” series motherboards, which would have undergone extensive testing before being sold. Maybe the vendor is now filling this gap in the line-up with those C236 based motherboards. It might be a little confusing why we’ve been writing so much about the Gigabyte boards in the past paragraph. To us it’s interesting and also to a certain extent questionable to see that a vendor combines a server/workstation chipset with gaming grade hardware. Looking at products from all the other vendors there is nothing comparable and ASUS as well as MSI strictly stick to the server/workstation market when it comes to this particular chipset. Bottom line it’s quite hard to find a specific advantage for the C236 chipset in the consumer segment. Finding reasons for a gamer or even an enthusiast to prefer a C236 based motherboard over a Z170 model is almost impossible. We can only think of one valid point to support C236 in the consumer segment. This is that there are some Xeon processors, like the E3-1230 v5 (257 Euro), which feature four cores and Hyper Threading, that are substantially cheaper than the Core i7-6700K (335 Euro), which is the only consumer-grade socket 1151 CPU also featuring four cores and eight threads. Nevertheless it needs to be mentioned that on former chipsets like Z97 it was possible to also use Xeon processors. When Intel introduced Z170 that possibility was removed and socket LGA1151 Xeon CPUs only work on C232 and C236 chipset based motherboards.